Atlantic Multidecadal Variability (AMV) is investigated in a millennial control simulation with the Kiel Climate Model (KCM), a coupled atmosphere–ocean–sea ice model. An oscillatory mode with approximately 60 years period and characteristics similar to observations is identified with the aid of three-dimensional temperature and salinity joint empirical orthogonal function analysis. The mode explains 30 % of variability on centennial and shorter timescales in the upper 2,000 m of the North Atlantic. It is associated with changes in the Atlantic Meridional Overturning Circulation (AMOC) of ±1–2 Sv and Atlantic Sea Surface Temperature (SST) of ±0.2 °C. AMV in KCM results from an out-of-phase interaction between horizontal and vertical ocean circulation, coupled through Irminger Sea convection. Wintertime convection in this region is mainly controlled by salinity anomalies transported by the Subpolar Gyre (SPG). Increased (decreased) dense water formation in this region leads to a stronger (weaker) AMOC after 15 years, and this in turn leads to a weaker (stronger) SPG after another 15 years. The key role of salinity variations in the subpolar North Atlantic for AMV is confirmed in a 1,000 year long simulation with salinity restored to model climatology: No low frequency variations in convection are simulated, and the 60 year mode of variability is absent. We thank Richard Greatbatch for fruitful discussions and Jennifer Mecking for help with matlab plotting. J.B. and N.K. were supported by the Deutsche Forschungsgemeinshaft under the Emmy Noether programme (Grant KE 1471/2-1). The research leading to these results has received funding from the European Community's 7th framework programme THOR (grant agreement No. GA212643), SUMO (ERC Grant # 266722), and STEPS (PCIG10-GA-2011-304243) projects. 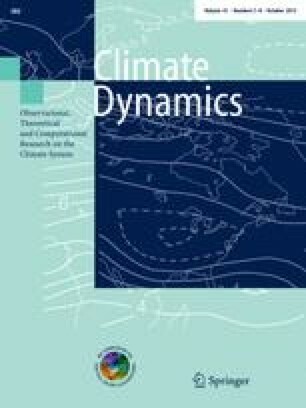 The Centre for Climate Dynamics is acknowledged. The model integrations were performed at the Computing Centre of Kiel University and at DKRZ Hamburg.